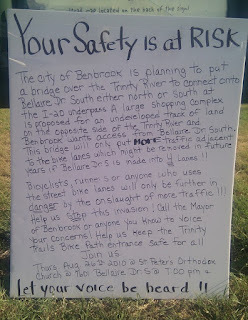 Will Benbrook Bridge Effect Trinity Trails Along Bellaire? 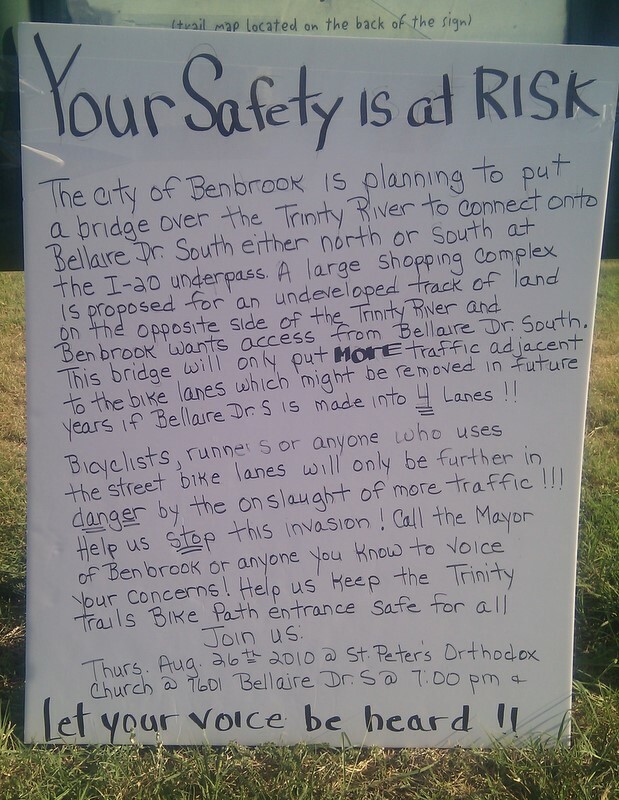 Basically the sign represented that residents (both Fort Worth and Benbrook citizens) living along Bellaire are concerned that a bridge across the Trinity near I-20 will increase traffic on Bellaire. The sign, though, was directed at those of us that ride/walk/run the Trinity Trails. It warned that the increased traffic would make us less safe and eventually would lead to the elimination of the trail along Bellaire because Bellaire would inevitably be made a four lane road because of all the extra traffic. This caught my attention. If that were ever to occur, it would cut off a substantial part of the southwest portion of the Trinity Trails (leading into Benbrook. Last night I attended the meeting mentioned on the sign. It took place at St. Peter's Orthodox Church on Bellaire Dr. 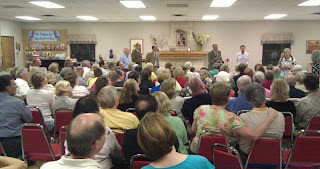 The meeting was standing room only and attended by at least 200 citizens. On hand to answer questions was Benbrook Mayor Jerry Dittrich, Benbrook City Manager Andy Wayman, Fort Worth City Councilman Zim Zimmerman and Benbrooks Fire and Police Chiefs. A show of hands revealed that the vast majority of the citizens in attendance were Fort Worth City residents... the rest live in Benbrook. The City of Benbrook has not yet hired an engineer to do a study of the impact of the proposed project, so there are no precise plans, but the city prepared some Questions and Answers about the Proposed Clear Fork Bridge [pdf document]. Benbrook's stated main reason for building the bridge is to decrease response time by their Fire, EMS and police to their citizens across the Trinity from their fire and police stations. Many of the citizens contended that the real reason for the bridge is for a commercial development in Benbrook on the south side of I-20. As it turned out, there wasn't much mention of the Trinity Trails. But a couple people did bring up the possibility that Bellaire would be expanded to 4 lanes which would eliminate the bike lanes. One citizen stated that it was a foregone conclusion that this would happen if the bridge was built. Near the end of the meeting Fort Worth Councilman Zim Zimmerman stated: "Bike trails are an integral part of Fort Worth's future plans and Bellaire Drive will not be made into 4 lanes and the bike trails eliminated... at least not while I'm in office." This is what I came to hear. That the trails will be preserved. Councilman Zimmerman went on to explain that Benbrook could do what Benbrook wanted with their land, but that Fort Worth would do what it could to control traffic along Bellaire even if that means more traffic signals at intersections. It is a complicated issue and it is far from being resolved, but there does seem to be a commitment to the Trinity Trails no matter what the outcome of the bridge issue. The men standing in front (from left to right) are Benbrook Mayor Jerry Dittrich, Benbrook City Manager Andy Wayman, Fort Worth City Manager Dale Fisseler, and Fort Worth City Councilman Zim Zimmerman.